Stand out front of hitter with external image (nail). The “catcher’s glove” ball marker inline with hitter’s belly button is inner 1/3 of plate left-center field approach (for righty, reverse for lefty). It takes 8,000 pounds per square inch of force, in ONE DIRECTION, to hit a ball 400-feet. I see coaches generally teaching a “kicking back” of barrel towards the catcher. I found deeply accelerating barrel same for all pitch depths to be ineffective for my hitters. 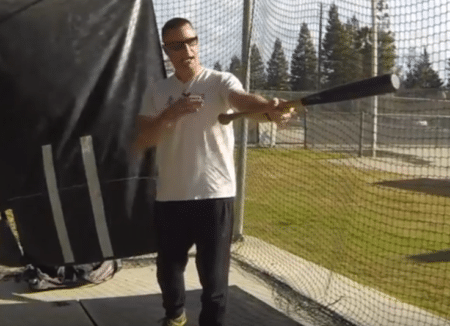 As you’ll see in the syncing of these two drills, the distance between what catcher’s glove the hitter hits and the depth of impact is the same. For example, the DISTANCE between hitting catcher’s glove position #1 above to optimum impact on the outer 1/3 of the plate SHOULD MATCH hitting catcher’s glove position #3 above to optimum impact on the inner 1/3 of the plate. You still following me? I was teaching the same blanket “deep barrel” acceleration as everyone else, but my cleaner hitters mechanically were having a challenge barreling up the inner 1/3 pitch. You see, their swing path was taking too long in getting to the inner 1/3 pitch with the generalized “deep barrel” approach. And when you get the hitter to LIVE, make sure they understand before pitcher throws the ball, they default to the middle approach, and make the smaller adjustment in or out, depending on pitch depth. Sub-optimal force = slipping lines, and pounding two nails over (ex. for righty, driving outer 1/3 to left-center). Just think about it, if it takes 8,000-pounds per square inch of force in one direction to hit a ball 400-feet, and that’s optimal…what happens if the hitter uses “Sub-optimal force” like in the above bullet point? Right! It’s going to take more force to hit it farther. I dunno how much, but taking a guess in the aforementioned sub-optimal example, it may take 12,000 or 16,000-pounds per square inch of force to hit the ball 400-feet pounding two nails over, so make it easy..hit it where it’s pitched! After this lesson, typically the “light-bulb” goes on with my hitters. I hope this helps! Hey Joey, Great external cues! I agree totally. I use Matt Nokes around the Horn angle drill with my guys to emphasize directional force. When I set up at different angles, and toss the ball in the direction of their nose, they should hit the ball at a 45 degree angle from the line it comes in on. These angles allow for optimum carry in batted ball distance. If you add hand and barrel speeds to contact force which is comprised of 4 areas. Hand path, weight transfer, impact position of the hands and barrel and the type of bat being used (length and weight) plus velocity of incoming pitch, overall batted ball distance is obtained based upon launch angles positive or negative. So directional force is a huge factor in generating power. Well done my friend. Take care Joey. Coach DeLong, don’t worry I know what you were referring to. Great drill by Nokes. Thank you and keep up the great work my friend.